The qualified plumbers, builders and electricians from the London-based EZ Builders are able to ensure that your bathroom is handled professionally. The Bulgarians (whom we hired) were meticulous, attentive and efficient. Nick West’s builder is EZ Builders. We operates in the following London areas. Central London, Hampstead, West Hampstead, Kensington, Westminster, Holland Park, Maida Vale, Chelsea, Fulham, Queensway, Shepherd’s Bush, Barnes, Richmond, Hammersmith, Wandsworth, Islington, Finchley, East Finchley, Golders Green, Putney, Clapham and Kilburn. If we cover your London area, use our free building cost calculator or contact us on 0790 523 0243. We have undertaken hundreds of jobs, big and small, varying from home improvement to business contracts and covering a wide range of tasks: Kitchens, Bathrooms, Extensions, Conversions, Plumbing, Electrical, Painting and Decorating. We have all the necessary skills and experience required to handle your project from start to finish. We will coordinate the whole project and provide all services you need. We are flexible to working hours and understand the needs for business continuity and offer out-of-hours building works to minimise disruption. We are prepared to work at weekends or even around the clock to meet your needs. Interior and exterior painting and decorating, home and office painting and decorating, plastering, texture painting, decorative painting, wallpapering, interior painting, exterior painting, wallpaper stripping. Plumbing installations and services, sanitary fittings, rainwater pipes and gutters, radiators installation, towel rails installation, showers, bathroom suites and sinks, baths and toilets, heating. House extensions and house renovations, design, construction, painting and decorating, tiling and carpeting, double glazing, roofing, bricklaying. Loft conversions, garage conversions, basement conversions, roof conversions, design, construction, painting and decorating, tiling and carpeting. We are punctual, sensitive to the needs of our customers, and reasonably priced. I used EZ Builders to do a couple of different jobs in our flat, one was to fix the work of another builder which they did an incredible job on and the other was to paint a couple of the rooms on our house which we were also really pleased with. The team were very professional and they achieved the work in the time frame they told us they would and they came in under the budget they had estimated when they first quoted the work which was always going to be a welcome surprise! We have a couple of new jobs that we will need to do in the new year and we will definitely be working with EZ Builders for these jobs. We hired EZ Builders based on (a) the recommendation of our sanitary ware supplier, (b) vetting by our general contractor, and (c) their competitive price quote. Their primary remit was to install 2 bathrooms and a cloakroom including tiling walls and floors. We are pleased with their performance: the quality of their workmanship, their ability to keep within schedule and to coordinate with other tradesmen, and overall professionalism and ease to work with. We have no hesitation in recommending them or using them again should the occasion arise. The guys have done plenty of work on my flat – from structural work to finishing and making good – and all of it has been excellent. Most importantly to me, they're very reliable and pleasant to deal with. EZ Builders were recommended to us by our next-door neighbour. Over the last years, Dinko, Peter and the team have re-done 2 of our bathrooms and built us a new completely new ensuite bathroom upstairs. They also re-painted the outside of the house and have done various internal decorating and carpentry work. Whilst not cheap, they are polite, honest, reliable and professional & have a “can-do” attitude to the inevitable problems that can arise in old Victorian houses. I recommend them without reservation as “go to” builders in Central London. I have used EZ builders for all 3 of my restaurants ( B & K salt bar and Tongue and brisket) and I found them to be excellent builders. They were extremely professional and all there work was completed on time and to a very high standard. 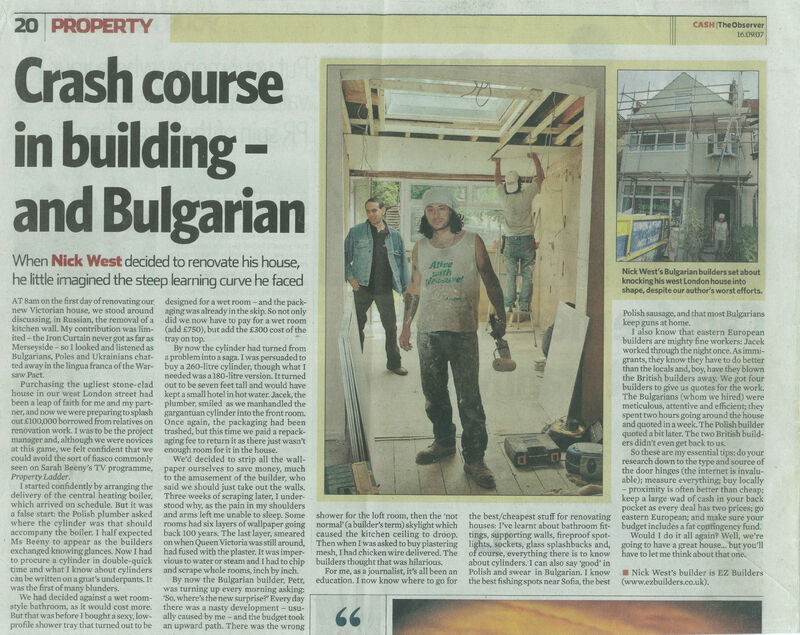 I have recommend Dinko and his team to a number of friends and they all spoke very highly of EZ builders. I would highly recommend them to anybody looking for good, hard working, honest and reliable builders. Used their services twice, both times to renovate a flat completely - plumbing, flooring, tiling, decorating, replacing windows, etc. Those guys are solid professionals. Not only they provide fantastic quality and always get the job done on time, they will also step in with their professional advise to ensure you get the best result and value for your money. Could not recommend them more! We are always at your service, since customer satisfaction is our number one priority. Copyright © 2004-2017 EZ Builders London. All rights reserved.